Coronoid fractures were once thought to be inconsequential. But they have been recognised to be of great importance as minor incongruity of the anteromedial facet have been shown to lead to elbow arthrosis and in presence of other fractures and elbow dislocation they have been shown to lead to poor results. When olecranon or coronoid fracture is associated with elbow dislocation, restoration of trochlear notch is required for ulnohumeral stability. The proximal ulna has 2 articular facets. The trochlear notch (incisura semilunaris) articulates with the trochlea and the lesser sigmoid notch articulates with the radial head. Trochlear notch forms an arc of 190 degrees. The central part of the notch is devoid of articular cartilage and olecranon osteotomy is ideally done through this area. The coronoid consists of an anterior projection and an medial projection. The anterior projection of coronoid makes it a key stabiliser of ulnohumeral joint by helping it resist the posteriorly directed forces. The medial projection forms sublime tubercle which supports the anteromedial facet. Anteromedial facet also helps in resisting varus forces. The anterior bundle of ulnar collateral ligament is attached to the anteromedial facet. The distal articular surface of the humerus is tilted anteriorly by 30 degrees, and the trochlear fossa is tilted posteriorly by 30 degrees. This helps in increasing the degree of flexion and also helps in increasing the height of coronoid process which deepens the trochlear notch increasing the stability of elbow. Trochlea is spool shaped with wide transverse width and a deep central groove. Trochlear notch covers 180 degrees of trochlea. Ulnohumeral joint is the most important stabiliser of elbow in varus stress. It also contributes significantly to anteroposterior and rotatory stability. The function of elbow is to alter the distance between the trunk and hand by flexion-extension. It also allows rotation of the forearm. Elbow is one of the most stable joints of the body. Stability is provided by the osteoarticular structures and capsuloligamentous structures. Capsuloligamentous structures provide 50% of the mediolateral stability. Osteoarticular components that provide stability are deep trochlear notch with a prominent coronoid process, presence of a ridge in the trochlear notch with a corresponding groove in the trochlea, interlocking of olecranon and coronoid into corresponding fossae in the humerus and provision of lateral stability by the intact radial head. Valgus stability is due to intact lateral radiocapitellar articulation and the ulnar collateral ligament (UCL). UCL has a thin posterior and transverse bundles and a thick anterior bundle. Anterior bundle provides 30-50% of valgus stability. It is attached proximally to the central 2/3rd of the anteroinferior surface of the medial epicondyle. Distally it is attached 18mm posterior to the tip of coronoid, to the sublime tubercle at the base of the coronoid. Thus anterior bundle is dysfunctional in fractures involving the base of the coronoid. The brachialis insertion extends distal to the coronoid and hence not involved in coronoid fractures. The anterior bundle of the UCL, lateral ulnar collateral ligament, anterior capsule of elbow and a part of brachialis muscle insert on the coronoid process and are often disrupted by elbow dislocation and coronoid fracture. Patients present with history of elbow injury. Careful elicitation of history will help in the identification of the exact mechanism of injury and the magnitude. As these injuries are often due to high velocity injuries, associated injuries are common. Look for life threatening and limb threatening injuries. Usually AP and lateral views of the elbow are sufficient for emergency management. If there is a dislocation, it should be reduced by closed manipulation and stability after reduction should be assessed in the flexion and extension in supination. If unstable assess stability in pronation. If again unstable, assess stability in flexion. Take post-reduction x-rays. Ensure that the elbow is concentrically reduced and take special care to confirm anatomical reduction of radial head. Look for any loose fragments and subtle signs of subluxation. Look for other associated fractures. 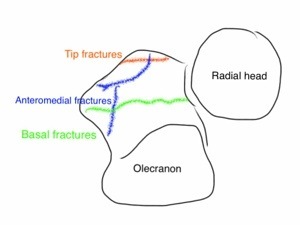 Coronoid fractures may be confused with radial head fragments. Commonest mechanism of injury to the elbow is a fall on the outstretched hand leading to compression, external rotation and supination of the forearm at the elbow leading to posterolateral rotatory instability of elbow. But an uncommon injury pattern is compression, internal rotation and varus leading to posteromedial rotatory instability of elbow characterised by fracture of the facet of coronoid. These fractures are different from classical transverse fracture as they are vertical or oblique with only subtle findings on the x-ray. Anteromedial facet fractures often show only subtle narrowing of joint space on the medial part of ulnohumeral joint on the AP view and also a double shadow for the articular surface. CT with 3D reconstruction is a must for proper evaluation of coronoid fractures. Often what appears as a small fragment on the x-ray will be revealed to be a large fragment on CT. Type I- Fracture of the tip. Suggestive of elbow dislocation. Soft tissue injury more than bony injury. Type II- Upto 50% of coronoid involved. Ulnohumeral joint may or may not be unstable. If unstable fixation is required. Type III- Fracture of more than 50% of coronoid. Usually not comminuted. Needs ORIF. Size of the fragment cannot be used as a guideline for fixation. Fixation is indicated if the elbow is unstable and if more than 50% of the height of coronoid is involved. The main indication for coronoid fixation is presence of varus or valgus instability. The method of treatment is determined by the following factors. Presence or absence of ulnohumeral subluxation. Presence or absence of radial head fracture. Size and location of fragment. If there is persistent ulnohumeral subluxation or instability, if the fragment is small; repair the lateral collateral ligament and reattach the anterior capsule. Large coronoid fragment needs open reduction and internal fixation. Displaced radial head fracture should be fixed or replaced and if the fragment is small; repair the lateral collateral ligament and reattach the anterior capsule. Large coronoid fragment needs open reduction and internal fixation. Coronoid fracture is fixed first through the lateral approach followed by radial head and ligament repair. Biggest challenge in fixation of coronoid fracture is adequate surgical exposure. As the coronoid process is deep to the common flexor origin, exposure from medial side is difficult and limited. Anterior exposure carries the risk of injury to brachial artery and median nerve. Exposure from posterior aspect provide only limited visualisation. Medial approach may be done through FCU-Split approach or extended medial approach describe by Hotchkiss. Both approaches can be done through a global posterior approach or a medial incision. FCU-split approach is done by isolating the ulnar nerve, retracting it posteriorly and then separating the humeral and ulnar heads of flexor carpi ulnaris. Gently elevate the FCU and FDS from the proximal ulna in a distal to proximal direction to expose the coronoid. Anterior bundle of UCL should be carefully preserved. The flexor-pronator muscle belly is retracted anteriorly and the ulnar nerve is retracted posteriorly. Extended medial approach of Hotchkiss utilises the plane between the FCU and the humeral head of FDS. In presence of terrible triad of elbow (elbow dislocation with radial head and coronoid fracture) coronoid can be exposed from the lateral aspect through a modified Kocher approach by retracting the ruptured lateral collateral ligament. In comminuted fractures of the coronoid base, exposure may be an anterior approach. Fractures of the coronoid may occur in following situations, and their management differs. As a part of fracture dislocation of elbow. As a part of comminuted fractures of proximal ulna. Isolated coronoid fractures usually involve the tip only. Most of these fractures have associated collateral ligament injury and careful assessment often reveal that there was an associated dislocation of the elbow at time of injury, which got reduced spontaneously. Type 1 coronoid fractures have very small fragments. Isolated tip fractures can be left alone if the elbow is stable and if there is no mechanical block to movement. Instability and anteromedial facet fractures are treated by surgery. Driscoll type 1 fractures are fixed with small screws, cerclage, suture anchor or K wires. Driscoll type 1 fractures are fixed with small screws, cerclage, suture anchor or K wires. If fragments are very small then Lasso type sutures are passed a through the attached anterior capsule around the fractured fragment and brought out through drill holes made from the posterior cortex of ulna and tied. TIbial ACL jig or Herbert screw jig may be utilised for making the drill holes. An important part of surgical treatment is reattachment of anterior capsule and repair of lateral collateral ligament. A variant is a fracture involving the anteromedial facet, which is now considered to be posteromedial rotatory instability. O’Driscoll Type 2 anteromedial facet fractures are vertical or oblique fractures. They can be treated by screw fixation or mini fragment buttress plating. Specialised coronoid plates may be used for this purpose. Anteromedial facet fractures are fixed by medial plating through FCU-Split or Hotchkiss approach. An important part of surgical treatment is reattachment of anterior capsule and repair of lateral collateral ligament. O’Driscoll type 3 fractures require fixation using plates, screws and occasionally hinged external fixation. Screws may be directed from posterolateral to anteromedial direction if a posterior approach is utilised. In simple elbow dislocations without fracture, after reduction most joints are stable allowing early mobilisation. Simple elbow dislocations can be treated with closed reduction and early controlled mobilisation. If one of the bony components that contribute to stability is fractured then the chance of instability and recurrent dislocation increases. In complex fracture dislocations, the stability of elbow depends on the size and location of coronoid fracture, degree of comminution of radial head, severity of associated ligamentous injury and interposition of soft tissue or bone fragments. Treatment of elbow dislocation depends on the bony and ligamentous injuries. In complex fracture dislocations of the elbow, a structured protocol based treatment is necessary. Successful functional outcome can be achieved with stable fixation of the fracture and early elbow mobilisation. Nonoperative treatment, is associated with high rate of early arthritis, recurrent dislocation, unstable elbow, post-traumatic joint stiffness, and nonunion. Hence coronoid fractures combined with elbow dislocation must be treated surgically. Ablove RH, Moy OJ, Howard C, Peimer CA, S’Doia S. Ulnar coronoid process anatomy: possible implications for elbow instability. Clin Orthop Relat Res 2006;(449):259-6. Regan W, Morrey B. Fractures of the coronoid process of the ulna. J Bone Joint Surg (Am) 1989;71:1348–54. O’Driscoll SW, Jupiter JB, Cohen MS, Ring D, McKee MD. Difficult elbow fractures: pearls and pitfalls. Instr Course Lect 2003;52:113-34. Ring D. Fractures of the coronoid process of the ulna. J Hand Surg [Am] 2006;31:1679-89. Doornberg JN, Ring DC. Fracture of the anteromedial facet of the coronoid process. J Bone Joint Surg (Am) 2006;88(10): 2216–24. Pugh DM, Wild LM, Schemitsch EH, King GJ, McKee MD. Standard surgical protocol to treat elbow dislocations with radial head and coronoid fractures. J Bone Joint Surg [Am] 2004;86:1122-30.